Since USNG is standardized, it can be understood and used as a common geographic framework for response. Learn more about how it works in USNG Overview articles. Use USNG hard-copy maps or online maps that enable coordinates to be described exactly. Romer readers can be used to find the exact USNG coordinates to describe any place in a uniform, standardized manner. Learn more about the USGS U.S. Topo products that include USNG. You are walking along a forest trail and come across a seriously injured hiker. 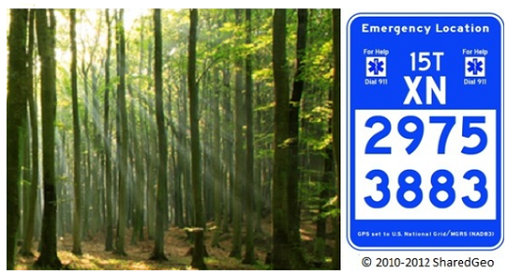 U.S. National Grid Emergency Location Markers (ELMs) could help deliver a speedy response! ELMs are signs that provide the U.S. National Grid Coordinates and can be used to communicate an exact geographic location. The USNG Information Center is dedicated to providing educational items and resources to support use of the U. S. National Grid.